End-Side Scraper From The East Wenatchee Clovis Site. This is the largest of the 8 or more uniface tools that were found during the excavation of the East Wenatchee Clovis site. Uniface tools are made from flakes that are flaked on one side only. 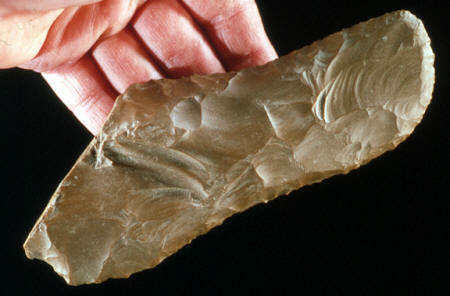 They represent the simplest form of stone tools. 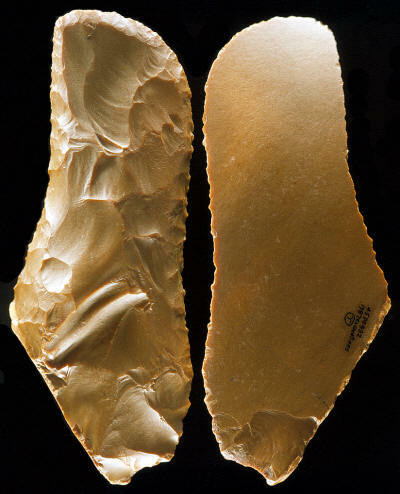 The East Wenatchee Clovis site produced several different types of uniface tools, such as simple utilized flakes, gravers, side-scrapers and the end-side scraper illustrated here. This end-side scraper is made of Jasper and it measures 6 3/8 inches (16.2 cm) long. The East Wenatchee Clovis site is one of the most important Clovis sites found to date. The site produced the largest Clovis points ever found during an excavation. Five of the Wenatchee Clovis points are above 8 inches (20.3 cm) in length and at least two or three are 9 inches (22.8 cm) or slightly longer. Also, several different types of stone tools and 13 beveled bone rods were found. The bone artifacts have yet to be satisfactorily identified. They are the most mysterious objects found on the site. The East Wenatchee Clovis site was discovered in 1987 in an apple orchard by workers digging an irrigation ditch. This picture shows both sides of the largest scraper that was found during the excavation of the East Wenatchee Clovis site. It's made of Jasper and measures 6 3/8 inches (16.2 cm) long.